Even though we’re now several weeks removed from AWP, I find myself mentioning Rick Bass and Stellarondo to anyone who will listen. Don’t get me wrong—I went to several inspiring panels, including A Shapeless Flame: The Nature of Poetry and Desire, and I especially enjoyed The Sun’s fortieth anniversary reading. But Rick Bass and Stellarondo presented something wholly different. Because this was my first time experiencing AWP, and in an effort to narrow my choices, I gave myself the task of attempting to visit panels and readings of writers included in Lookout’s new anthology, Astoria to Zion: Twenty-Six Stories of Risk and Abandon from Ecotone’s First Decade. I hoped this mission might help me more easily navigate the conference of 550 events and more than 2,000 presenters. Which explains how I ended up sitting on the front row for this amazing collaboration of literature and music. I was introduced to the project when gathering items for Lookout’s weekly Lit News Roundup, and I had to hear it for myself. Rick Bass sat onstage as band members readied instruments including a musical saw, pedal steel guitar, and vibraphone. The ebb and flow of the music followed the pace of the stories. As I realized the scenes in my imagination—the couple in a canoe (“The Canoeists”), or the old woman sitting with a bear at her picnic table (“The Bear”), or a live fish being skinned (“The Fish”), the music heightened the emotion. It reminded me how similarly literature and music provide entrance to another world. Based on the resounding applause at the end of the concert, I wasn’t the only one transported to a place few other AWP panels tend to take us. If you have the chance to hear Rick Bass and Stellarondo perform live, don’t hesitate. You can thank me later. If they aren’t playing in your area soon, you can always sample the music here, or buy their digital album. 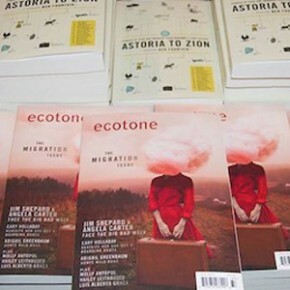 Read Rick Bass’s story “The Blue Tree” in Astoria to Zion: Twenty-Six Stories of Risk and Abandon from Ecotone’s First Decade.